Welcome to Around the Hemline! As my first official blog post, I am ecstatic to start this new project in my life! About 4 months ago, I moved from sunny Southern California to the hustle of New York City on a whim. I found an opportunity within my firm (aka Corporate America), asked for it & got it. What better way to feed my addiction for the fashion industry than to move to New York and kick off my first week with the Mercedes-Benz Fashion Week 2011?! Within the next few months, I spent working my “corporate-day-job” and finding a means to make something worthwhile with my time in the Big Apple. Thus, this blog. Fashion. I love it. It expresses. It disguises. It becomes our unspoken communication to others. My blog, simply put, is about “Fashion and Everything Around It.” I’ll share things that interests me (of course), outfits I’ve put together, fashion education & history, fashion styling, and things that happen around my life and those around me. So, if that’s okay with you, then read on! 2012 marks a milestone in my life! 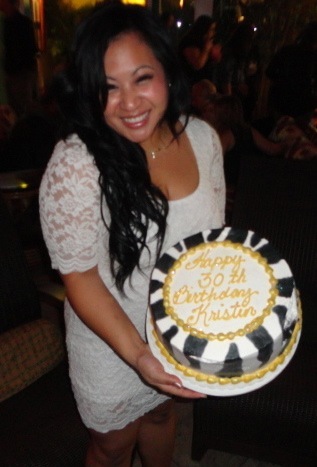 I started the first week by celebrating my 30th year in existence in the world, otherwise known as the “Dirty 30.” So, here I am, 30, newly single, baggage from my 20s thrown out like a pair of last season’s line and more fabulous than my “Ugly Duckling” stages (c’mon, we all had that stage)! My first blog outfit is my birthday suit (no, not the newborn baby look!)! I celebrated back home in Southern California at one of my favorite bars/club, Mai Tai in Long Beach & was excited to be home from the blistering cold! Welcome to the blogging world and good luck in NYC! Cute look! Love the shoes!